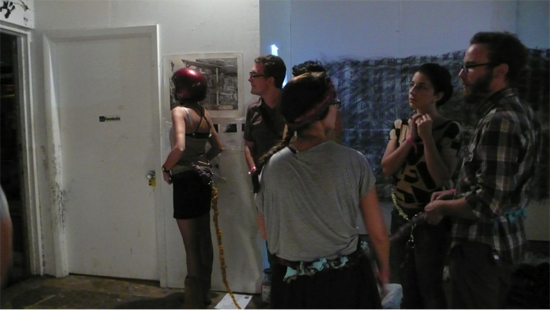 Analog Analogue, an art team founded by recent Florida State University studio art MFA graduates, was invited by Brooklyn’s Grace Exhibition Space to perform at Fountain Art Fair during Art Basel Miami 2012. Analog Analogue presented multiple works over the course of the fair’s four days, from December 6-9. The works included combinations of sculpture, performance and installation, beginning with a repeat performance of I Think You Can Take It, wherein Analog Analogue closed themselves into an eight-foot cubic structure with holes cut into the sides. The temptingly bare, glittering gypsum-white cube stood in Fountain’s yard, rewarding the curious viewers who reached into its holes with objects of contemplation, small art supplies, and surprising interactions. Art objects were handed into the cube as well, and the talented crowd that Fountain attracts leapt at the opportunity to tag the white cube. 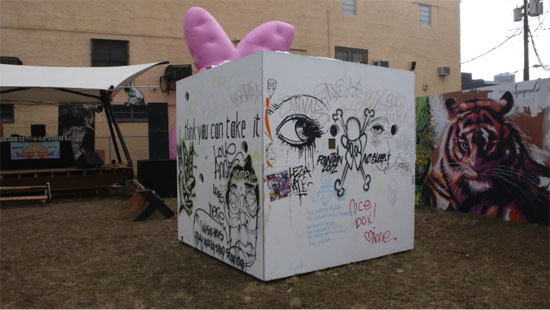 In the light of the following day, the structure was covered by a dialogue of spray paint, chalk, and marker, involving the cube, the art team, the taggers, and the tags. 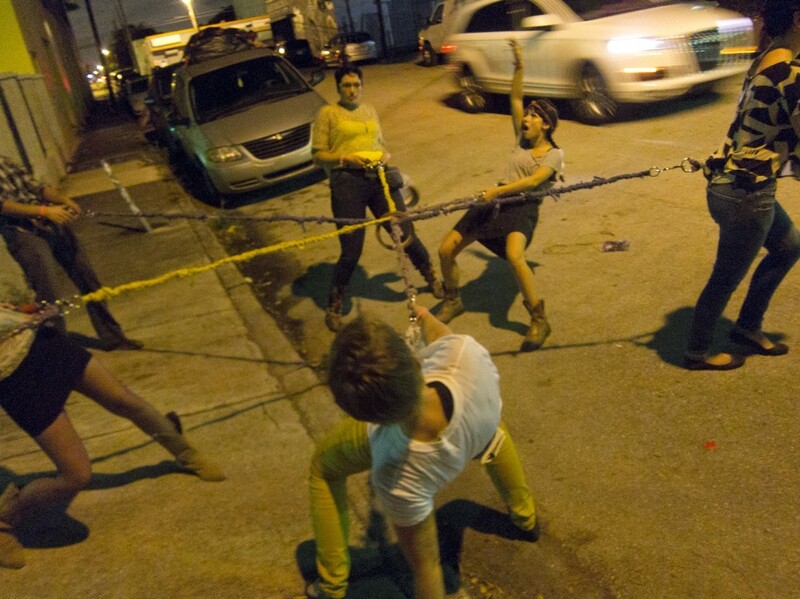 Shareholders’ Agreement, a performance where Analog Analogue took in the sights of the art fair while tethered to one another by crocheted rag ropes, thereby creating joy, mild chaos, worry, and questions amongst the fairgoers and art dealers about the team’s bathroom protocol. The team improvised their way through said questions, danced in concert, did the rope limbo, got tangled, and had some good conversations. 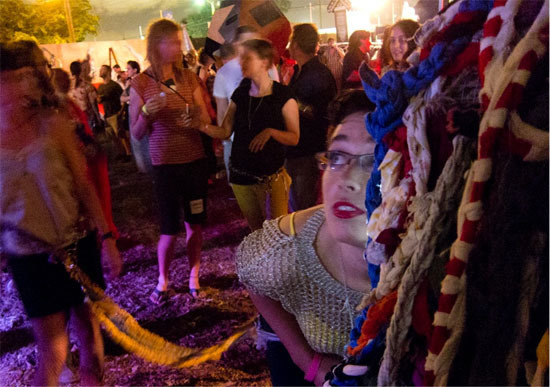 As night fell and Fountain shifted into Saturday night party mode, people began to notice KaLIVEoscope, comprised in part by a roughly person-sized sculpture covered in multicolored rag ropes with an illuminated opening in the front. Peering into the opening revealed a mirrored prism which refracted and multiplied a triangular image of the viewer’s eye, nose, lips, fingers, hair, keys, phone screen, business card, flashing toy wand, or whatever else they decided to place in front of the opening. 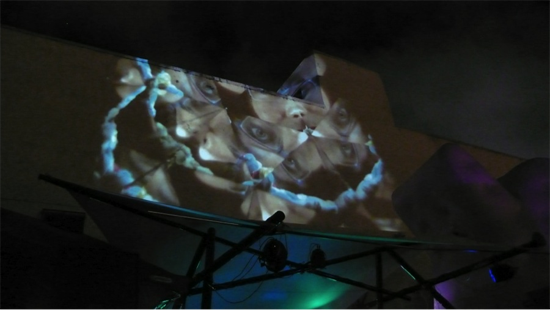 The full effect of the mirrored sculpture was simultaneously projected onto the side of the building behind the DJ booth, occupied that particular evening by Brooklyn’s Tiki Disco. Many interacted with the piece to the rhythm of the music, creating a hypnotizing, live, improvisational analog visualization that passersby could see from five blocks down the street. Analog Analogue finished the weekend with a piece called Ragtagging. 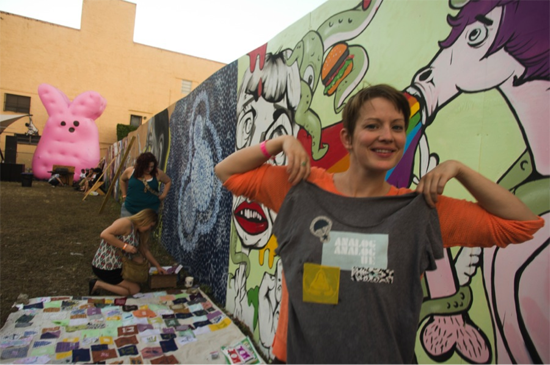 Visitors were offered a chance to co-opt their own clothing with handmade fabric patches, which could be ironed on to anything they were willing to remove. Analog Analogue produces situational works of art, which aim to surprise, amuse, empower, and provoke thought in an inclusive manner. The team tries to hold expectations and ideas lightly, creating projects with participation and activation in mind, which allows the viewers to be co-authors of the work. Grace Exhibition Space is devoted exclusively to contemporary visual performance, and presents over 30 curated live performance art exhibitions each year, showcasing new work by more than 400 performance artists from across the United States and the world. For more information and updates about Analog Analogue, you can visit their website at http://www.analoganalogue.org. or friend them on facebook.